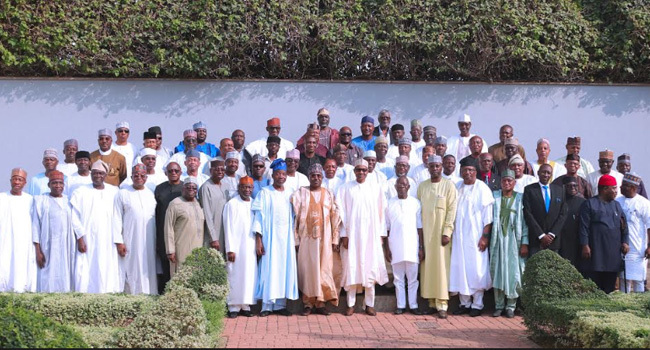 A group of retired Army Generals, Admirals, Marshals and former Military Governors/Administrators have endorsed President Muhammadu Buhari for a second term in office. The ex-officers made their declaration in support for Buhari’s re-election when they paid a visit to the President in Abuja on Monday. The leader of the delegation, Brigadier-General Buba Marwa, who was military governor in Borno, and later military administrator of Lagos State, said the retired top officers thought it right to visit the President. Gen Marwa said the visit was to tell President Buhari that he has represented his constituency well. “We the retired armed forces officers, representing 99.9% of our colleagues say that we are proud of you; proud to be associated with your administration; and proud to witness this era of Nigeria rising again under your able leadership. The most senior of the retired officers, Vice Admiral Jubrila Ayinla, a former Chief of Naval Staff, who said future generations would acquit President Buhari “most creditably”. On his part, President Muhammadu Buhari reiterated his commitment to the country, saying that his objective is clear and he will continue to do his best as the President of the country. The President said, “God has made this country great. We have human and material resources, and may God continue to give us the right leaders. My objective is very clear, and I will continue to do my best. “We have no other country but Nigeria. We will stay here and salvage it together”. “The patriotism imbued in us by the military will ever remain relevant. Let’s do our best for this country,” he said.